WARSAW — The shelves of Owen’s Market on Center Street, Warsaw, are a little emptier today after Grace College students and members of the local community swept through the store for a good cause. 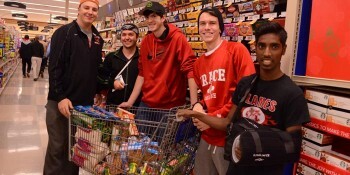 Yesterday, Wednesday, Nov. 18, marked the fifth annual Supermarket Sweep, an event hosted by Grace College to stock local food pantries for the upcoming winter and holiday season. Grace College Coordinator of Student Involvement Kearstin Criswell explained the procedure. 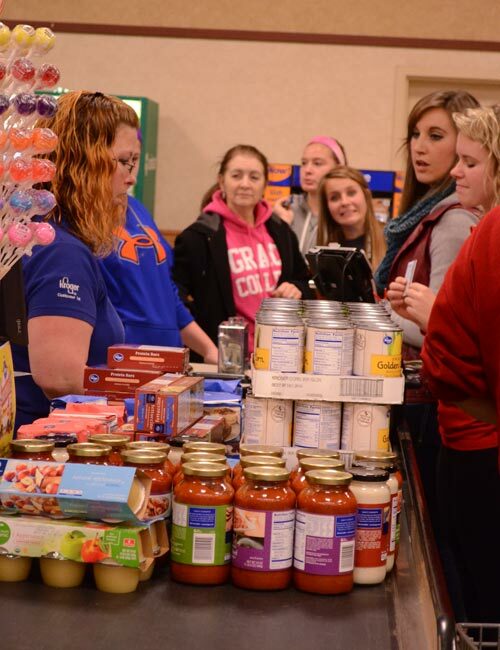 Though Supermarket Sweep was an all-day event, students did not begin arriving until around 9 p.m. They competed to see which groups could purchase the most items, spend the most money and invite the most Grace faculty and staff and community members. Prizes were awarded for each of these categories. They could also win gift cards that would allow them to purchase even more items to donate. Even before the students flooded the store, volunteers from the community and from Mission Point Community Church spent the day shopping for Supermarket Sweep. 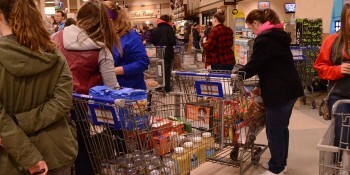 For about two hours, the aisles and checkout lines were packed with Grace students as they made their selections, filled their carts and paid for their groceries. They then loaded everything into boxes to take to Combined Community Services, the Salvation Army and Our Father’s House. All baby items went to Heartline Pregnancy Center. From left, Jon Opiela, Keane Hayes, Zach Sagester, Thomas Barram and Chandran Higgins pause for a moment after filing their cart. 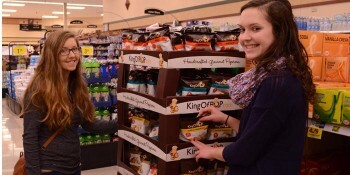 Emma Wheeler, left, and Katarina Chilcote browse grocery items. Students fill shopping carts for local food pantries. Students deliberate over their purchase. Annkelly Myers, left, and Rachel Jones discuss their next purchase.